A series of videos funded by the Australian Learning & Teaching Council covering topics such as how to conduct effective online discussions, how to manage your time when teaching online, planning online classes, and engaging and motivating students online. My favourite bit: The way each video has a selection of online educators’ voices which together make a mosaic of very useful advice. 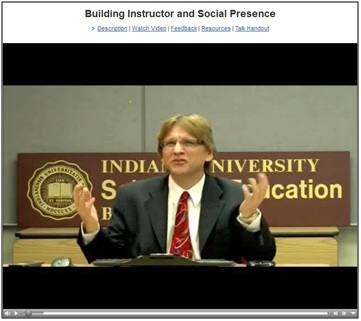 Another series of videos about online teaching and learning, this time courtesy of Curt Bonk at the University of Indiana. Each video lasts around 10 minutes, and they are 27 of them – a total of ermmm 270 minutes of viewing time. My favourite bit: The videos are all accompanied by extra resources, links, and slides in downloadable pdf format. This conference was live streamed just last week, and I was lucky enough to be invited to moderate a great group of speakers: Nigel Pike, Anna Stanton, Debra Marsh and Nik Peachey gave their views and experiences of online and blended teaching and training. The audience sent in questions in real-time via the website and Twitter, and some excellent discussions ensued. My favourite bit: Discussing whether online communication is as ‘real’ as face-to-face communication. You can guess what the panel’s response to that was. This presentation was delivered at the recent 2011 eLearning Africa conference by Gerald Henzinger (his slides are here). Gerald describes a blended learning model implemented in Mozambique. Note the high penetration of mobile phones and how this related to the project. From the Chronicle of Higher Education, a look at some of the challenges faced by online educators. This video is only 3 minutes long but covers a lot of ground. My favourite bit: the first two comments underneath the video, which point out some of the effects of ‘bad’ online teaching and learning. This blog will be on hold until September – happy holidays!